summarizes the major genetic alterations found in diffuse gliomas. Some of these alterations are highly correlated with the grade of gliomas, especially for astrocytic tumors. Several genetic alterations have been associated with GBM, especially primary GBM. These alterations include loss of chromosome 10, mutation of the PTEN gene, and amplification of the EGFR gene with resulting over expression of the EGFR protein. While the clinical use of these markers has not been completely validated, there is growing evidence that they may prove useful as a molecular adjunct for glioma grading. The presence of EGFR amplification, chromosome 10 loss, or PTEN mutation, or some combination of the three, in a glioma indicates that the tumor is likely a GBM. Importantly, a small but significant proportion of tumors with the histologic features of AA have one or more of these alterations.7-11 It is reasonable to hypothesize that since patients with GBM have a poor prognosis, then patients whose AA shares molecular characteristics with GBM also may have a poor survival. A recent Mayo Clinic/North Central Cancer Treatment Group (NCCTG) study indicated that A A with chromosome 10 loss or PTEN mutation behaves like GBM.8 The median survival of patients with AA and chromosome 10 loss or PTEN mutation was approximately 4 months, a survival worse than that of patients with GBM (who had a median survival of approximately 12 months). The median survival of patients whose AA lacked these alterations was 34 months. This difference in survival was statistically significant even after adjustment for patient age, performance score, and extent of resection, all of which are important prognostic variables for patients with gliomas. Importantly, the patient survival for GBM with and without chromosome 10 loss or PTEN mutations was very similar.8 It is possible that sampling bias (in terms of the tissue available for histologic and molecular analysis) may have accounted for the differences. 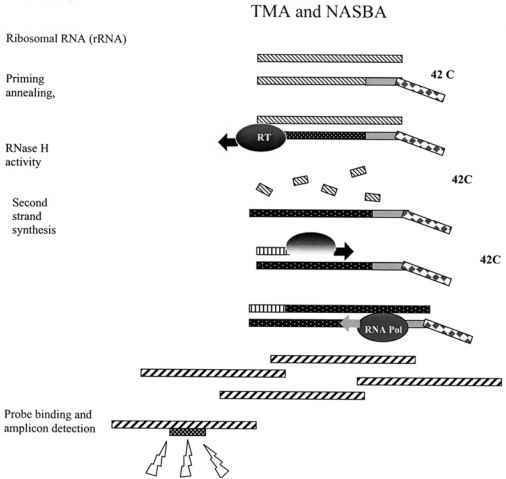 However, sampling bias is a difficult problem to overcome in routine clinical practice, and molecular testing for chromosome 10 loss or PTEN mutations in a sample of a tumor with the features of an AA indicates that the tumor may be a GBM. Figure 27-1. 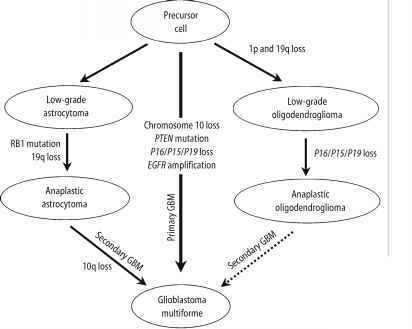 Possible genetic pathways of diffuse glioma formation and progression (modified from References 5 and 6). Histologic classification is based on current WHO guidelines.2 Although the molecular genetic evidence is increasing, it is not widely accepted that anaplastic oligodendroglioma progresses to GBM (dashed arrow). Although PTEN, chromosome 10, TP53, and EGFR alterations have been found to be correlated with clinical grade and thus with patient prognosis, they have yet to be routinely used in clinical practice for two reasons. First, the studies require broader validation. Second, and more importantly, the presence or absence of such alterations does not currently change the clinical management of these patients. High-grade glioma trials designed to specifically evaluate the clinical usefulness of these markers are needed to move these molecular markers into clinical practice.